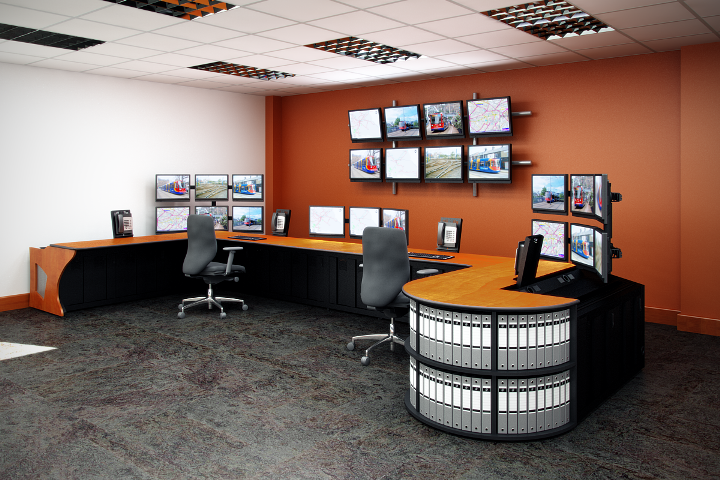 Leading control room furniture manufacturer Winsted has equipped Stagecoach Supertram’s recently revamped control room in Sheffield with a brand new, ergonomically designed and modular console. The unit is now being used to help operators monitoring operations on the modern tram network serving the city. Supertram provides three light rail routes covering some 30km (50% of the system runs on streets with mixed traffic) and each of the 25 vehicles in the fleet carries around 250 passengers. The tram network, which began operation in 1995, links five park and ride sites with the busy city centre and gives easy access to the rail station, shopping areas, both of Sheffield’s prestigious universities, the Cathedral, sports arenas and many new popular entertainment venues. Winsted was commissioned to source the console through dg8, an independent design and engineering group overseeing Supertram’s control room refurbishment. Winsted’s inclusion in the project is the first time it’s collaborated with either dg8 or Supertram, as Darryl Lymer, from Winsted’s Business Development team explains: “We were invited to provide ideas and produced computer aided design (CAD) drawings and colour renders illustrating solutions to the control room furniture’s performance requirements. Winsted suggested using a console from its Command range and a Prestige Insight unit was duly provided, attractively finished in red cherry wood. The console supplied was custom specified to include a credenza (radial shelving, providing stylish and practical added work surface storage space for manuals, binders etc), along with a CPU (PC) shelf, pull-out keyboard, phone trays and power outlets. This Prestige Insight console offers long-term advantages through its modular design, which allows the console to be adapted to meet changing future requirements, thereby extending its operational lifespan. Commenting on its collaboration with Winsted, Stagecoach Supertram’s IT & Comms Manager Nick Harrison confirmed that the company is pleased with both the standard of equipment provided and the service provided: “The control room dated back to 1994 and needed to be completely gutted and rebuilt, with the operators temporarily re-located during this process,” he explains. “Winsted was able to work around delays in our original schedule and we found the company to be very flexible and adaptable. The new console was installed within the one day timeframe that we’d been promised and has made a significant contribution towards the resounding success of this project”.